The purpose of this study is to develop novel chiral π-conjugated (macro)molecular systems, which can detect the chirality of target molecules as changes in their absorption, luminescence, visible color, or electrical properties. For human’s further progress in coexistence with nature, the effective utilization of renewable material, biomass, has been getting more and more important. Polysaccharides, such as cellulose and amylase, are not only biomass existing in abundance, but also polymer materials with a precisely controlled structure. 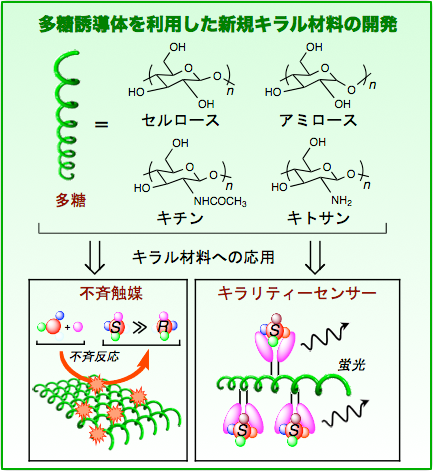 In this research project, we intend to develop new functional polymers with chiral recognition ability through chemical modifications of these renewable resources, polysaccharides. My main topic is the further improvement of conversion efficiency for practical application of organic thin film solar batteries. The key to accomplishing high efficiency is the optical energy conversion material that composes the organic power-generating tier of organic thin-film solar-power batteries. The conjugated polymer that is generally used for the organic power-generating tier is currently unable to utilize solar light efficiently because of its inability to absorb the long-wave length region of solar light. I therefore aim to generate a new conjugated polymer with a narrow band gap that can absorb long-wave length solar light for application as an optical energy conversion material. 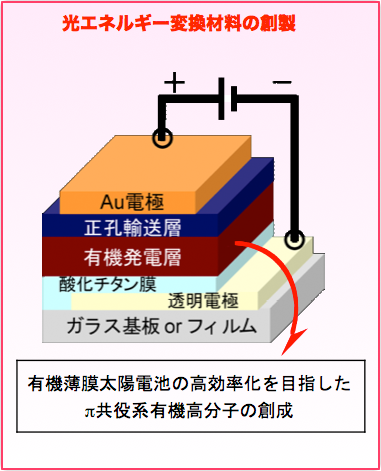 My current study is being carried out in collaboration with the lab of TAKAHASHI Mitsunobu in the Division of Material Chemistry, and we intend to develop a practical organic thin film solar battery.